Tall cigar plant is a semi-woody subshrub that grows up to 3-4 ft tall with a similar spread. Oppositely arranged, narrow lance-shaped leaves are crowded on the stems. They vary in size, and can be up to 6 in long. They are long near the bases, gradually shortening toward the stem tips. 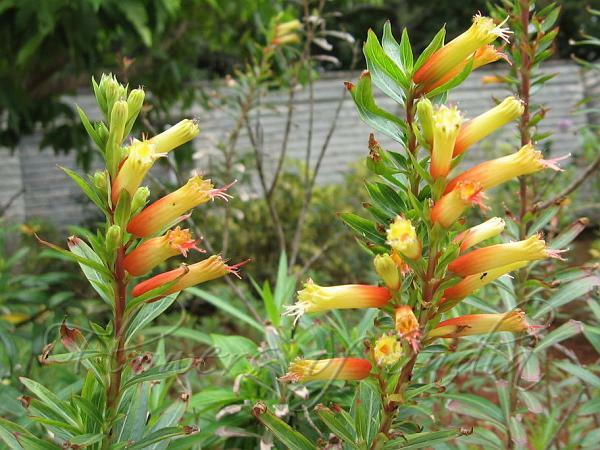 The flowers are very showy, red-yellow tube-shaped, 1.5 in long, shading to yellow-green. They are borne in profusion on the branching tips of the stems. Tiny glandular hairs on the flowers give them a sticky surface. 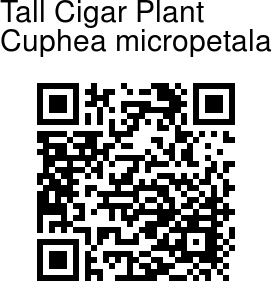 Tall Cigar Plant is native to Mexico, and is cultivated as a garden plant.